Trichinellosis, formerly called trichinosis or trichiniasis (Trich from Greek thrix meaning hair), is an infection caused by nematodes of the genus Trichinella, most commonly T spiralis in humans. Through historical, paleopathologic, and, most recently, genomic studies, the complex intertwined history of humans, their food, and this worm has become better defined. Genomic evidence suggests the presence of Trichinella as a distinct species since some time in the mid to latter Miocene period (around 20 million years ago). To date, 8 distinct species and 3 genotypes in 2 clads, encapsulated and nonencapsulated, have been found to infect mammals, birds, and reptiles around the globe. Not all of these have been identified in humans. Geopolitical and cultural factors, such as increases in global movement of food products and persons, evolving into the 21st century are leading to a resurgence of human infections in areas that have been free of infection for decades. This resurgence has particular relevance to emergency medicine because people may present to EDs in areas with little or no presence of trichinellosis locally, as they may have contracted it while travelling and because early diagnosis is associated with improved treatment outcomes. Early diagnosis depends on clinician awareness and uncovering relevant patient history since the initial clinical presentation may be nonspecific. Infection is initiated by ingestion of viable larvae in raw or undercooked meat. Digestive action liberates the larvae. The liberated larvae develop into adults in the duodenum and jejunum, where they mate and bear offspring. The adult worms are expelled in the stool. Newborn larvae penetrate the intestinal wall, enter the lymphatic system, and move via the bloodstream to areas of implantation. Although the exact mechanism has not been elucidated, the newborn larvae have been implicated in cardiac and neurologic aspects of the disease. The life cycle is completed with the larvae invading a striated muscle cell. Patients who develop neurologic and cardiac dysfunctions have marked hypereosinophilia associated with arteriolar microthrombi, often simply from numbers of larvae, leading to areas of cerebral and myocardial infarction. Immunologic reactions are also deemed responsible for one of the hallmark clinical findings—palpebral edema. The direct trauma of the larva encysting in muscle cells, coupled with the immunologic response, is responsible for other clinical features (eg, fever, myalgias). Typically, the intramuscular cysts eventually calcify. See the image below. Life cycle of Trichinella species parasite. Image courtesy of the Centers for Disease Control and Prevention. The US national surveillance system has been a passive system with links to state and local levels without active sampling of pork carcasses, an expensive practice used in some countries. [16, 17] The US Department of Agriculture has, however, used periodic surveillance of farm-raised pigs. In a 1999 study, the major risk factor for seropositivity in tested pigs was access to live wildlife or wildlife carcasses. Rats, raccoons, skunks, and opossums have been shown to be wild sources of domestic pork contamination. Home raising of pigs, with feeding of raw garbage instead of grain, is still a common practice in a large part of the world at all levels of development. In many countries, pigs roam freely, leading to contact with sylvatic sources of infection. Celebration of the Thai New Year has been associated with 200-600 cases in a single year and is a known annual source of multiple cases. [27, 28] Group tourist travel has also been associated with cluster outbreaks. In several Southeast Asian countries, raw pork sausage and other dishes are considered delicacies and are regularly associated with outbreaks. Trichinellosis must be considered a risk when eating the flesh of any animal that might have fed on uncooked animal flesh. Many animals generally not considered carnivorous will eat meat products when presented in a form they can chew, that is, usually chopped, or ground and combined with vegetable matter. This most commonly occurs on small farms when animals are fed table scraps or the scraps from butchering another farm animal. Rats also represent a reservoir in settings where raw animal scraps are left out for domestic animals to eat. Although generally thought of as a disease of omnivorous or carnivorous animals, herbivores have demonstrated infection, most likely from prepared feed that contained remnants of infected animals. In France, horse meat, largely imported, has become the most common source with more than a dozen outbreaks involving more than 3000 human victims since 1976. Interestingly, the same meat exporting countries supply various other European Union countries that have no human trichinellosis; unlike the French and Italians, those countries do not have the culinary habit of eating meat raw or minimally cooked. Mutton and goat have become a recognized vector in countries where pig consumption is restricted for religious or economic reasons. This rather extensive listing of international incidence of animal and human infection has been presented to offer some direct information regarding areas of particular concern as well as to further make the point of the importance of dietary and travel history in patients with diarrhea, particularly with associated myalgias and eosinophilia. Specific death rate information is not established. Death is rare without development of neurologic and cardiac involvement. The primary morbidity is persistent myalgia and fatigue in cases that do not develop neurocardiac involvement. Following neurocardiac involvement, persistent variable dysfunction of either system may develop, depending upon the distribution of lesions. Trichinella infection does not vary among different races. Variations in disease presence are based more on cultural food preparation and consumption practices. All age groups reportedly have been affected; however, trichinellosis most commonly occurs in persons aged 20-49 years. Zarlenga DS, Rosenthal BM, La Rosa G, Pozio E, Hoberg EP. Post-Miocene expansion, colonization, and host switching drove speciation among extant nematodes of the archaic genus Trichinella. Proc Natl Acad Sci U S A. 2006 May 9. 103(19):7354-9. [Medline]. Pozio E, Zarlenga DS. Recent advances on the taxonomy, systematics and epidemiology of Trichinella. Int J Parasitol. 2005 Oct. 35(11-12):1191-204. [Medline]. Neghina R, Moldovan R, Marincu I, Calma CL, Neghina AM. The roots of evil: the amazing history of trichinellosis and Trichinella parasites. Parasitol Res. 2012 Feb. 110(2):503-8. [Medline]. [Guideline] Dupouy-Camet, Bruschi F. Management and Diagnosis of Human Trichinellosis. FAO/WHO/OIE Guidelines for the Surveillance, Prevention, and Control of Trichinellosis. Trichinellosis.org. Available at http://www.trichinellosis.org/uploads/FAO-WHO-OIE_Guidelines.pdf.. Accessed: 28 June, 2012. Despommier D. The history of Trichinella. The Trichinella Page. Available at http://www.trichinella.org/index.htm. Accessed: November 2, 2007. Cook GC. Outbreak of trichinosis (trichiniasis)-contracted in London in 1879. Postgrad Med J. 2001 Jan. 77(903):62-3. [Medline]. Pozio E. Factors affecting the flow among domestic, synanthropic and sylvatic cycles of Trichinella. Vet Parasitol. 2000 Dec 1. 93(3-4):241-62. [Medline]. Despommier D. Biology of the Nurse Cell — Parasite Complex. The Trichinella Page. Available at http://www.trichinella.org/bio_nursecell.htm. Accessed: 3 November, 2007. Dabrowska M, Skoneczny M, Zielinski Z, Rode W. Nurse cell of Trichinella spp. as a model of long-term cell cycle arrest. Cell Cycle. 2008 Jul 15. 7(14):2167-78. [Medline]. Wu Z, Sofronic-Milosavljevic Lj, Nagano I, Takahashi Y. Trichinella spiralis: nurse cell formation with emphasis on analogy to muscle cell repair. Parasit Vectors. 2008. 1(1):27. [Medline]. Pozio E, Bruschi F. The importance of correct terminology in describing the muscular stage of Trichinella infection. Trends Parasitol. 2001 Aug. 17(8):362. [Medline]. Fourestie V, Douceron H, Brugieres P, Ancelle T, Lejonc JL, Gherardi RK. Neurotrichinosis. A cerebrovascular disease associated with myocardial injury and hypereosinophilia. Brain. 1993 Jun. 116 (Pt 3):603-16. [Medline]. Wilson NO, Hall RL, Montgomery SP, Jones JL. Trichinellosis surveillance--United States, 2008-2012. MMWR Surveill Summ. 2015 Jan 16. 64 Suppl 1:1-8. [Medline]. [Full Text]. Roy SL, Lopez AS, Schantz PM. Trichinellosis surveillance--United States, 1997-2001. MMWR Surveill Summ. 2003 Jul 25. 52(6):1-8. [Medline]. Graves T, Harkess J, Crutcher JM. Case report: locally acquired trichinosis in an immigrant from Southeast Asia. J Okla State Med Assoc. 1996 Nov. 89(11):402-4. [Medline]. van Knapen F. Control of trichinellosis by inspection and farm management practices. Vet Parasitol. 2000 Dec 1. 93(3-4):385-92. [Medline]. Pozio E. Trichinellosis in the European union: epidemiology, ecology and economic impact. Parasitol Today. 1998 Jan. 14(1):35-8. [Medline]. Gamble HR, Brady RC, Bulaga LL, et al. Prevalence and risk association for Trichinella infection in domestic pigs in the northeastern United States. Vet Parasitol. 1999 Mar 22. 82(1):59-69. [Medline]. Prescribed treatment of pork and products containing pork to destroy trichinae. United States Code of Federal Regulations. Accessed November 2, 2007: 9 CFR 318.10 (Rev 1/1/2007): [Full Text]. Pyburn DG, Gamble HR, Wagstrom EA, Anderson LA, Miller LE. Trichinae certification in the United States pork industry. Vet Parasitol. 2005 Sep 5. 132(1-2):179-83. [Medline]. Murrell KD, Pozio E. Worldwide occurrence and impact of human trichinellosis, 1986-2009. Emerg Infect Dis. 2011 Dec. 17(12):2194-202. [Medline]. Murrell KD, Pozio E. Trichinellosis: the zoonosis that won't go quietly. Int J Parasitol. 2000 Nov. 30(12-13):1339-49. [Medline]. Dupouy-Camet J. Trichinellosis: a worldwide zoonosis. Vet Parasitol. 2000 Dec 1. 93(3-4):191-200. [Medline]. Pozio E. New patterns of Trichinella infection. Vet Parasitol. 2001 Jul 12. 98(1-3):133-48. [Medline]. Gajadhar AA, Gamble HR. Historical perspectives and current global challenges of Trichinella and trichinellosis. Vet Parasitol. 2000 Dec 1. 93(3-4):183-9. [Medline]. Gamble HR, Bessonov AS, Cuperlovic K, et al. 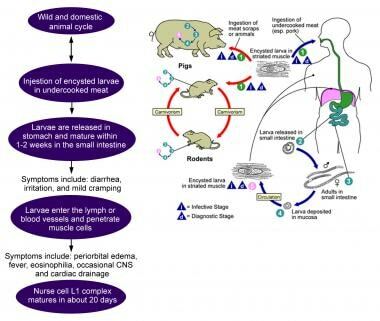 International Commission on Trichinellosis: recommendations on methods for the control of Trichinella in domestic and wild animals intended for human consumption. Vet Parasitol. 2000 Dec 1. 93(3-4):393-408. [Medline]. Kaewpitoon N, Kaewpitoon SJ, Pengsaa P. Food-borne parasitic zoonosis: distribution of trichinosis in Thailand. World J Gastroenterol. 2008 Jun 14. 14(22):3471-5. [Medline]. [Full Text]. Watt G, Saisorn S, Jongsakul K, Sakolvaree Y, Chaicumpa W. Blinded, placebo-controlled trial of antiparasitic drugs for trichinosis myositis. J Infect Dis. 2000 Jul. 182(1):371-4. [Medline]. Kurup A, Yew WS, San LM, Ang B, Lim S, Tai GK. Outbreak of suspected trichinosis among travelers returning from a neighboring island. J Travel Med. 2000 Jul-Aug. 7(4):189-93. [Medline]. Centers for Disease Control and Prevention. Trichinellosis outbreaks--Northrhine-Westfalia, Germany, 1998-1999. MMWR Morb Mortal Wkly Rep. 1999 Jun 18. 48(23):488-92. [Medline]. [Full Text]. Kramme S, Schmiedel S. Trichinellosis imported to Germany from Poland, cardiac complications. International Commission on Trichinellosis News Postings. 2007 Accessed: 15 August, 2007. [Full Text]. World Health Organization. Imported human outbreak of trichinellosis, Italy. Wkly Epidemiol Rec. 2001 Mar 30. 76(13):97-8. [Medline]. [Full Text]. Samuelsson S, ed. Outbreak of trichinosis. Epi-News. 2004; 14. Staten Serum Institute. Available at http://www.ssi.dk/sw10275.asp. Accessed: 15 October, 2007. Dupouy-Camet J. Trichinellosis: still a concern for Europe. Euro Surveill. 2006. 11(1):5. [Medline]. [Full Text]. Neghina R. Trichinellosis, a Romanian never-ending story. An overview of traditions, culinary customs, and public health conditions. Foodborne Pathog Dis. 2010 Sep. 7(9):999-1003. [Medline]. Kapel CM. Changes in the EU legislation on Trichinella inspection. Neghina R, Neghina AM, Marincu I, Moldovan R, Iacobiciu I. Epidemiological and diagnostic findings during a 16-year-long trichinellosis surveillance in Timis County, Romania. Vet Parasitol. 2009 Feb 23. 159(3-4):328-31. [Medline]. Papatsiros VG, Boutsini S, Ntousi D, et al. Detection and zoonotic potential of Trichinella spp. from free-range pig farming in Greece. Foodborne Pathog Dis. 2012 Jun. 9(6):536-40. [Medline]. Akkoc N, Kuruuzum Z, Akar S, et al. A large-scale outbreak of trichinellosis caused by Trichinella britovi in Turkey. Zoonoses Public Health. 2009 Mar. 56(2):65-70. [Medline]. Boireau P, Vallee I, Roman T, et al. Trichinella in horses: a low frequency infection with high human risk. Vet Parasitol. 2000 Dec 1. 93(3-4):309-20. [Medline]. Liu M, Boireau P. Trichinellosis in China: epidemiology and control. Trends Parasitol. 2002 Dec. 18(12):553-6. [Medline]. Takahashi Y, Mingyuan L, Waikagul J. Epidemiology of trichinellosis in Asia and the Pacific Rim. Vet Parasitol. 2000 Dec 1. 93(3-4):227-39. [Medline]. Cui J, Wang ZQ, Kennedy MW. The re-emergence of trichinellosis in China?. Trends Parasitol. 2006 Feb. 22(2):54-5. [Medline]. Proulx JF, MacLean JD, Gyorkos TW, et al. Novel prevention program for trichinellosis in inuit communities. Clin Infect Dis. 2002 Jun 1. 34(11):1508-14. [Medline]. O'Brien F. Environmental health in the Canadian arctic of Nunavut: Our People - Our Land. Environment and Health International. 6(1):6-10. [Full Text]. Gallardo MT, Mateos L, Artieda J, et al. Outbreak of trichinellosis in Spain and Sweden due to consumption of wild boar meat contaminated with Trichinella britovi. Euro Surveill. 2007 Mar 15. 12(3):E070315.1. [Medline]. Pozio E, Darwin Murrell K. Systematics and epidemiology of trichinella. Adv Parasitol. 2006. 63:367-439. [Medline]. Gebreyes WA, Bahnson PB, Funk JA, McKean J, Patchanee P. Seroprevalence of Trichinella, Toxoplasma, and Salmonella in antimicrobial-free and conventional swine production systems. Foodborne Pathog Dis. 2008 Apr. 5(2):199-203. [Medline]. van der Giessen J, Fonville M, Bouwknegt M, Langelaar M, Vollema A. Seroprevalence of Trichinella spiralis and Toxoplasma gondii in pigs from different housing systems in The Netherlands. Vet Parasitol. 2007 Sep 30. 148(3-4):371-4. [Medline]. Müller N, Sager H, Schuppers M, Gottstein B. [Methods for investigating Trichinella infections in domestic and wild animals]. Schweiz Arch Tierheilkd. 2006 Sep. 148(9):463-71. [Medline]. Owen IL, Pozio E, Tamburrini A, et al. Focus of human trichinellosis in Papua New Guinea. Am J Trop Med Hyg. 2001 Nov. 65(5):553-7. [Medline]. Nuñez GG, Costantino SN, Gentile T, Venturiello SM. Immunoparasitological evaluation of Trichinella spiralis infection during human pregnancy: a small case series. Trans R Soc Trop Med Hyg. 2008 Jul. 102(7):662-8. [Medline]. Webster P, Kapel CM. Studies on vertical transmission of Trichinella spp. in experimentally infected ferrets (Mustela putorius furo), foxes (Vulpes vulpes), pigs, guinea pigs and mice. Vet Parasitol. 2005 Jun 30. 130(3-4):255-62. [Medline]. Dubinsky P, Boor A, Kincekova J, Tomasovicova O, Reiterova K, Bielik P. Congenital trichinellosis? Case report. Parasite. 2001 Jun. 8(2 Suppl):S180-2. [Medline]. Akar S, Gurler O, Pozio E, Onen F, Sari I, Gerceker E, et al. Frequency and severity of musculoskeletal symptoms in humans during an outbreak of trichinellosis caused by Trichinella britovi. J Parasitol. 2007 Apr. 93(2):341-4. [Medline]. Nikolic S, Vujosevic M, Sasic M, et al. [Neurologic manifestations in trichinosis]. Srp Arh Celok Lek. 1998 May-Jun. 126(5-6):209-13. [Medline]. Walsh DS, Jongsakul K, Watt G. Hand rash in trichinosis. Clin Exp Dermatol. 2001 May. 26(3):272-3. [Medline]. Astudillo LM, Arlet PM. Images in clinical medicine. The chemosis of trichinosis. N Engl J Med. 2004 Jul 29. 351(5):487. [Medline]. Bruschi F, Murrell KD. New aspects of human trichinellosis: the impact of new Trichinella species. Postgrad Med J. 2002 Jan. 78(915):15-22. [Medline]. Pozio E, Foggin CM, Gelanew T, et al. Trichinella zimbabwensis in wild reptiles of Zimbabwe and Mozambique and farmed reptiles of Ethiopia. Vet Parasitol. 2007 Feb 28. 143(3-4):305-10. [Medline]. Pozio E, Foggin CM, Gelanew T, Marucci G, Hailu A, Rossi P, et al. Trichinella zimbabwensis in wild reptiles of Zimbabwe and Mozambique and farmed reptiles of Ethiopia. Vet Parasitol. 2007 Feb 28. 143(3-4):305-10. [Medline]. Kociecka W. Trichinellosis: human disease, diagnosis and treatment. Vet Parasitol. 2000 Dec 1. 93 (3-4):365-83. [Medline]. Yera H, Andiva S, Perret C, Limonne D, Boireau P, Dupouy-Camet J. Development and evaluation of a Western blot kit for diagnosis of human trichinellosis. Clin Diagn Lab Immunol. 2003 Sep. 10(5):793-6. [Medline]. Robert F, Weil B, Kassis N, Dupouy-Camet J. Investigation of immunofluorescence cross-reactions against Trichinella spiralis by western blot (immunoblot) analysis. Clin Diagn Lab Immunol. 1996 Sep. 3(5):575-7. [Medline]. [Full Text]. Gelal F, Kumral E, Vidinli BD, Erdogan D, Yucel K, Erdogan N. Diffusion-weighted and conventional MR imaging in neurotrichinosis. Acta Radiol. 2005 Apr. 46(2):196-9. [Medline]. Neghina R, Neghina AM, Marincu I. Reviews on trichinellosis (III): cardiovascular involvement. Foodborne Pathog Dis. 2011 Aug. 8(8):853-60. [Medline]. Watt G, Silachamroon U. Areas of uncertainty in the management of human trichinellosis: a clinical perspective. Expert Rev Anti Infect Ther. 2004 Aug. 2(4):649-52. [Medline]. Pozio E, Sacchini D, Sacchi L, Tamburrini A, Alberici F. Failure of mebendazole in the treatment of humans with Trichinella spiralis infection at the stage of encapsulating larvae. Clin Infect Dis. 2001 Feb 15. 32(4):638-42. [Medline]. Neghina R, Neghina AM, Marincu I. Trichinellosis in hospitalized patients from a Romanian endemic area, 2007-2009. Clin Microbiol Infect. 2012 Jan. 18(1):86-90. [Medline]. Neghina R, Neghina AM, Marincu I. Trichinosis in children and adults. Caner A, Doskaya M, Degirmenci A, Can H, Baykan S, Uner A, et al. Comparison of the effects of Artemisia vulgaris and Artemisia absinthium growing in western Anatolia against trichinellosis (Trichinella spiralis) in rats. Exp Parasitol. 2008 May. 119(1):173-9. [Medline]. Cosoroaba I, Orjanu N. Congenital trichinellosis in the rat. Vet Parasitol. 1998 Jun 15. 77(2-3):147-51. [Medline]. Greene YG, Padovani T, Rudroff JA, Hall R, Austin C, Vernon M, et al. Trichinellosis caused by consumption of wild boar meat - Illinois, 2013. MMWR Morb Mortal Wkly Rep. 2014 May 23. 63 (20):451. [Medline]. [Full Text]. Photomicrograph depicting numbers of Trichinella spiralis cysts seen embedded in a muscle tissue specimen, in a case of trichinellosis. Image courtesy of the Centers for Disease Control and Prevention. I would like to thank the many primary level researchers from around the globe who helped me improve my understanding through email communications, sharing pdf and hard copies of publications to which I did not have direct access and encouraging me for the value of this "offbeat" Emergency Medicine topic. Thank you, Domo Arigato, Merci Beaucoup, Molto Gracie.